Free Printable Trick or Treat Halloween Word Search. Free Printable Trick or Treat Halloween Word Search, a spooky activity game for a fun Halloween Day Celebration with kids this October 31. Free printable Halloween word search game to share with kids and friends. Print it free using your home printer and have fun searching 24 Trick or Treat Halloween words. Find Halloween words like Jack-o’-lantern, Haunted House, Autumn, Ghost, Treat, Pumpkin, Dead, Witch, Costumes, Spider, Boo, Spooky, Moon, Black Cat and many more. 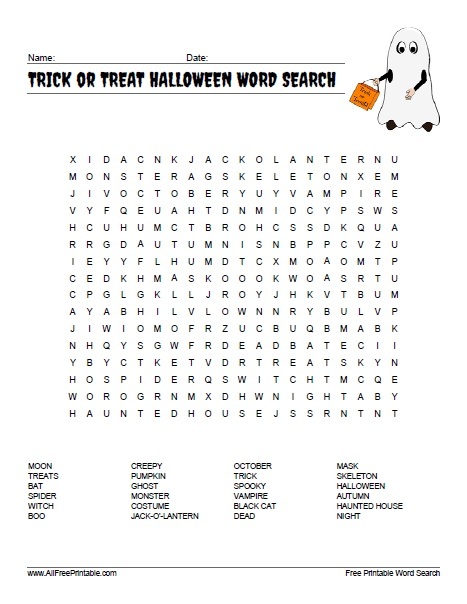 Click the link below to download or print the Halloween word search puzzle now in PDF format.